With the FIBA World Championship concluding on Sunday, I decided to keep the September basketball overload going by attending Game 2 of the WNBA Finals on Tuesday night. 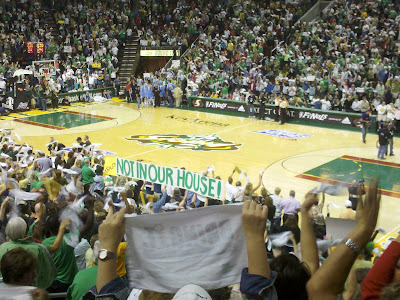 The Seattle Storm defeated the Atlanta Dream 87-84 in an electric atmosphere at KeyArena with 13,898 in attendance. Seattle took a 2-0 lead in the best-of-five series, and ran its overall season record to 34-6, including a perfect 21-0 at home. I had a great time, but I'm not here to implore you to become a WNBA fan. That's your choice. The WNBA can be so polarizing that supporters and detractors alike seem to end up staking out extreme positions either for or against the league. There can be a school of thought - a political argument, really - made by supporters that women's basketball is better than the men's version because it is a purer form of the game, with a patterned, fundamentally sound teamwork which harkens back to some indeterminate nostalgic days of yore in the men's game. I think this is both insulting to the amount of team play and mastery of fundamentals actually seen in the men's game, and ultimately a disservice to the women's game. I view men's basketball as clearly superior to women's basketball, mainly because of the far superior athleticism in the men's game. I appreciate the WNBA for what it is, without either overstating its quality or taking cheap shots at it. Regular readers of this space will know that I believe in respecting the game in all its forms. I can enjoy and respect that the WNBA features the best female players in the world - players who love the game as much and work as hard at it as their male counterparts - while still fully understanding that these players are far inferior to male professionals. WNBA basketball helps fill the hoops void in my life in the offseason months of the men's game. I find myself increasingly enjoying the league, not because of some vague echo to Hickory High, but rather, because the style of play increasingly resembles the NBA game. OK, chill for a second. I'm not talking about the pure aesthetic style of the game in terms of mid-air acrobatics or explosive speed and quickness - that's not comparable in any way - I'm talking about the approach to the game. I see the WNBA game - rather than relying on some 1950s-style offense, as the perception may be - being put in the hands of players who are asked to be playmakers, and who increasingly have the skill to do so. Kevin Pelton works his analytical magic for the women's game as well as the men's, and I found a couple things striking about his review of advanced stats for the 2010 WNBA regular season. One is that WNBA scoring has climbed to 80.3 points per game (compared to 69.2 ppg in the inaugural 1997 season), just a little bit below the NBA number of 83.7 points per game, pro-rated to 40 minutes. Two is that the WNBA actually exceeded the NBA in pace of game this season, with 77.2 possessions per team in a WNBA game, vs. a pro-rated NBA number of 76.1. Perhaps my view is skewed because the games I've attended have featured the two fastest-paced teams in the league, the Atlanta Dream and the Phoenix Mercury, but the final scores of the games I've attended have been 91-85, 82-74, and 87-84 - again, all in 40-minute games. These women get up and down the floor, and they put the ball in the basket. Phoenix plays the Paul Westhead style of organized non-stop running basketball. The point guard of Westhead's famous Loyola Marymount teams, Corey Gaines, is the current head coach, and Diana Taurasi is the maestro. Taurasi plays with an undeniable style and swagger - she'd like nothing more than to drain a pull-up three in your eye, with her quick release and picture-perfect shooting form, and then strut around and smile about it and enjoy it with her teammates. While Atlanta plays at the same pace, it was striking last night how its game was a much different approach than Phoenix's, significantly more chaotic - the Dream are more of a force of nature, who try to overwhelm their opponent with the athleticism and sheer relentlessness of their running game. A couple times, Atlanta's star player Angel McCoughtry grabbed a defensive rebound and simply turned and went like a bat out of hell down the court. On the one hand, Atlanta's style made for a bit more ragged game, their aggressive play leading to more turnovers created and forced. On the other, I often marveled at just how quickly Atlanta could score. Again, don't get me wrong, it wasn't NBA athleticism or anything close to it. But it was players using their athleticism - beating other players through the force of superior athleticism - which I find to be a striking improvement in the quality of the game. I didn't even get the Finals matchup I was hoping for - I wanted to see the New York Liberty and their star Cappie Pondexter, she of the killer crossover, who plays with the most NBA style in the league, so much so that she is the unquestioned consensus favorite female player of NBA players on Twitter. However, the Liberty were knocked out by the Dream in the Eastern Conference Finals, the clinching game a 105-93 affair in which McCoughtry's playoff-record 42 points outdueled Cappie's 36 and 9. I'm not trying to force-feed WNBA basketball to you, or telling you that it's equal to the NBA, or that you need to watch it out of the goodness of your heart, as a political gesture to support the women. Do what you want. I enjoy men's basketball significantly more than I enjoy women's basketball. The level of athleticism in the men's game is far superior to that of the women's. But women are, in my view, increasingly applying their athleticism as part of their games - increasingly imprinting the game with their individual styles - and that's made the WNBA increasingly enjoyable for me to watch. I can only tell you that I've attended three WNBA games this summer, and I've enjoyed the hell out of all of them. And, oh yeah: Storm basketball, baby. 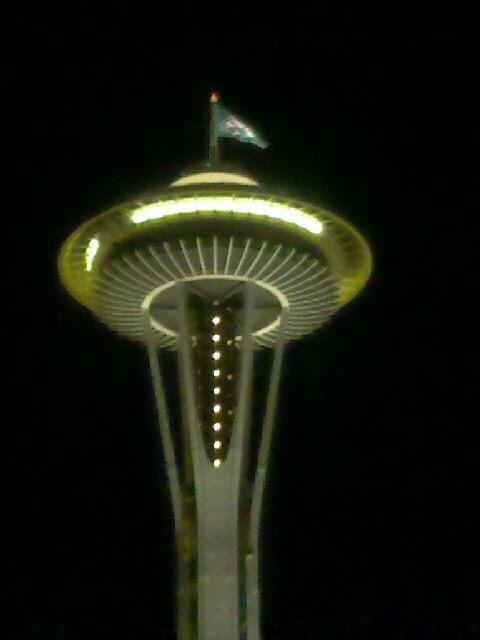 The Storm flag flew proudly above Seattle last night after Lauren Jackson, Sue Bird, Swin Cash and Tanisha Wright led the home side to a 2-0 series lead. One more to go for a second WNBA Championship! It is true the W of the NBA stands for a purer version of play relative to the W-less counterparts (the men's game). It's also true the physical aesthetics and quasi-And 1 presentation of the men's game makes it (for the average fan) more enjoyable to watch. On the surface, the female game lacks the athleticism necessary to keep us on the edge of our seats. However, a closer look reveals a great deal of acrobatic activity in the womens game, but it goes without notice because the game is still played below the rim. I've theorized for years that lowering the basket in the women's game would revolutionize the sport- at least from a marketing standpoint. Now we'd be able to see varying degrees of athleticism amongst the women and eventually, Doctor J and MJ like figures would emerge. There would be "high-flying" and memorable facials just like the boys. The game would capture the imagination of a new legion of fans who need that level of entertainment to be happy. Of course, with a new lease on the highlight life, the women's game would eventually suffer the same malady as the men's game-from a purist standpoint. Young girls will become enamored with dunking and shooting 3's -just like the boys, and fundamentals will become "old" school. Small price to pay for increased revenues and expanded fan base, right? Anon: That's a very fair point that those are loaded words, which may not be constructive to the discussion. You said, "Why must one be better than the other? They are different, and that is all." That is actually a point I was trying to reach. I was just trying to acknowledge the reality that NBA players can do things physically which WNBA players simply cannot do. I didn't mean it as any more than a straight factual statement, just like saying that Serena Williams is an inferior tennis player compared to hundreds of men's tennis players. But that hasn't stopped a player like Serena from imposing her athleticism and imprinting her own style in her own right, in her own game. And that's a point I think we're at in the WNBA, where players are better able to showcase their athleticism and their own individual styles, in their own game, even if they can't do things as spectacularly as men can. women bball players are better outside shooters than men.--FACT! just look at the WNBA's overall FT shooting numbers. i know the ball is slightly smaller, but still. ESPN.com's Mechelle Voepel wrote: John Wooden once made some observations about how he enjoyed what he called the "purity" of women's basketball. He was speaking about appreciating watching the fundamentally sound execution of the top women's players -- which shouldn't have surprised anybody, since doing things the right way was the very foundation of his life. Well, frankly, I find pure, fundamentally-sound basketball to be boring. I like pure, fundamentally-sound basketball with individual style on top of it, and I like women's basketball increasingly b/c I find it has more of the latter. only one thing I don't like about women's basketball - female basketball players are not as hot as female beach volley players.... for some reason they seem more like tom boys.... still though... it's good bball to watch. We don't know each other, but I'm a huge fan of your work. You have received a lot of nice comments towards your article:) Well-done... I am still looking for the information about how to write a conclusion for a research paper. Any ideas? Football notifications, social media and more Get latest scores and headlines sent straight to your phone, sign coach outlet online up to our newsletter and learn where to find us coach outlet store online on online. Today's football gossip The latest rumours and stories from around the world of football. Commentaries, clips and podcasts Enjoy the best debate, analysis and interviews with coach outlet store online 5 live and World Service football plus our official coach outlet online commentary listings. How to get into Football How to get into football the most popular sport in the world, with clubs and facilities throughout the UK. The BBC is not responsible for the content of external sites. Read about our approach to external linking. 0820jejeDes millions air jordan 5 metallic silver 2015 de dispositifs Jupiter Jack ont ​​été offerts et la plupart des gens trouvent qu'ils changent chaussures nike tn vraiment la façon dont ils sont capables d'agir nike air jordan 6 femme quand ils conduisent. Avec l'utilisation toujours populaire avec le web, nike jordan air ce style de vêtements ainsi que plusieurs marques diverses sont air jordan 5 china maintenant offerts aux célébrités de la mode consciente, les fans basket nike air max 1 woven et les adeptes ardents sur le World Wide Web. La basket femme nike blazer science et la technologie sont généralement composées sur le fond chaussure nike air max 90 femme des chaussures, qui est faite sur les matériaux moussants traditionnels air jordan 11 rouge pour améliorer le trou de mousse pour les rendre beaucoup plus délicate. Photo Restoration Services is a complex editing job. So, you have to be confirmed to give your desired photo in the hand of an expert photo editor. Experts do feel the alike you feel about your old photos. We can proudly ensure you that we have a huge team of editing experts! they can easily meet your photo editing demand. Do visit to test our photo restoration service quality.